Biophotonics deal with light interaction in biological substances such as tissues and cells at a scale from microns to the nano-level range. It plays an important role in healthcare services by lowering down the treatment cost along with suitable methodology for aging society. Biophotonics comprises of optics, nanotechnology, photonics and biotechnology. Goldstein Research analyst forecast the Biophotonics Market size is set to reach USD 65.0 billion by 2024, at a CAGR of 10.2% over the forecast years. 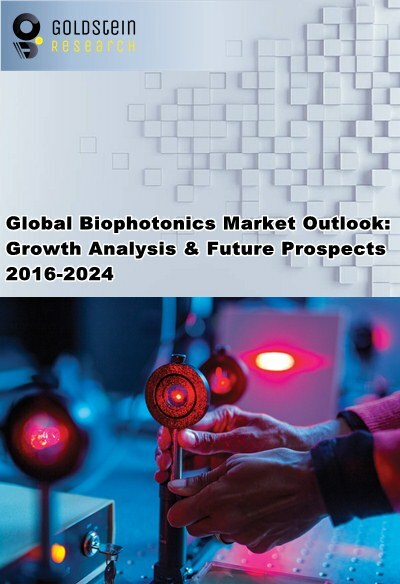 The report covers the present ground scenario and the future growth prospects of the Biophotonics Market for 2016-2024 along with the adoption rate of biophotonics in the verticals and the data related to innovations in the field of Biophotonics. We calculated the market size and revenue share on the basis of revenue generated from major players across the globe. On the basis of end user, the medical sector dominated with 55% of total biophotonics market share while demand for biophotonics from non-medical sectors is expected to gain momentum in the coming years and is expected to grow at the rate of 12.7% over the forecast years due to wide range of chemicals, toxins, and microbiological materials are usage in warfare and terror attacks. Biophotonics Market Outlook 2016-2024, has been prepared based on an in-depth market analysis from industry experts. The report covers the competitive landscape and current position of major players in the global Biophotonics Market. The report also includes porter’s five force model, SWOT analysis, company profiling, business strategies of market players and their business models. Global Biophotonics Market report also recognizes value chain analysis to understand the cost differentiation to provide competitive advantage to the existing and new entry players. Our global Biophotonics Market report comprises of the following companies as the key players: Affymetrix, Inc., Andor Technology Ltd., Becton, Dickinson and Company, Carl Zeiss AG, FEI Company, Hamamatsu Photonics K.K., Lumenis Ltd., Olympus Corporation, PerkinElmer, Inc., Zecotek Photonics Inc, Glenbrook Technologies Inc., Oxford Instruments Plc and Zenalux Biomedical Inc. According to the report, major driving factor for Biophotonics Market is its application in laser processing of tissues methods such as incision, coagulation, and excision follow various laser–tissue interaction procedures. These are involved as clinical measures in various medical fields such as ophthalmology, gynecology, urology, dentistry, and surgery of ear, nose, and throat. Intense control over the laser systems enhance the performance of treatments with high precision and also help to avoid harmful effects to the nearby tissues. Further, the report states that the hurdles in the medical technology industry are high: tens and often hundreds of millions of dollars of investment can be needed to gain regulatory approval, and there is often significant risk regarding whether or not companies will be reimbursed sufficiently by insurance organizations for their products. These hurdles are in addition to the basic hurdle of any new innovation: namely, that of market acceptance itself. Based on geography, North America held the highest market share of 37.5% in the overall biophotonics market closely followed by Europe as German companies and policy-makers are retaining and expanding the existing close cooperation between researchers, companies and doctors. However, APAC is also gaining the strength by adopting the policies that are needed to increase the commercialization of promising biophotonic innovations and being the most opportunistic market for biophotonics. What is the total market size of biophotonics market by 2024 and what would be the expected growth rate of the market over the forecasted period? What is the revenue of Biophotonics in 2015-16 and what would be the expected demand over the forecast period?